I have a few dice that are particularly special to me. There’s the badly-rounded d20 that is from one of my first sets, more than 30 years ago. It has been slowly crumbling for 20 years now, and is probably nowhere near fair any more, but the numbers it seems to favor are at least somewhat evenly distributed: 18, 19, 2, 3, 4, 5, 6, 7, 9. There’s my golf-ball-sized brass d20 that I daren’t roll on glass or nice wood. And then I have two sets of very special dice. I managed to get in on the kickstarter for dice made from Vesuvian lava, so I have a set of Fudge dice and a random dungeon die. Now I just need to play more Fudge/Fate/Shadow of Yesterday, so I get to use them. 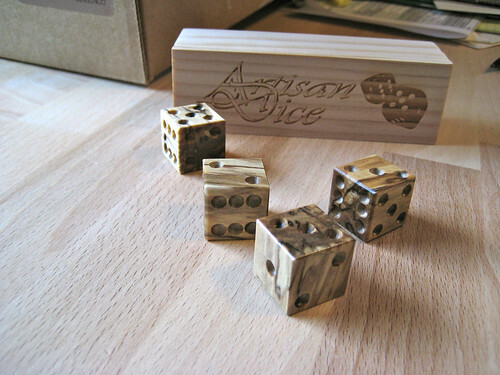 But definitely my favorite dice are a set of dice made from spalted Norway maple by Artisan Dice, which I got as a present from my in-laws. They are gorgeous and have a perfect feel, and the spalting makes them extra-unique. And I don’t have to worry about denting the table when I roll them. This has been a good spring for dice. Not that I needed any more. But I received the rewards for backing a couple cool crowdfunded projects, as well as a belated Christmas present. I thought I’d share partly just ’cause I think they’re cool, and partly to provide a little shout-out for the various creators. I was reading Darths & Droids, and R2’s player mentions that he got a set of “binary dice”, just for playing robot characters. He’s talking about “regular” dice numbered in base2 notation, and it got me curious. So, I went looking to see if anyone has done such a thing. Those who know me know that I seem to have extraordinarily poor luck with dice in games — not all randomizers, just dice. I’m sure some of it is selective memory, but, nonetheless, I have a story to tell of the worst die roll of my gaming career. I was playing AD&D, and I rolled a natural 20, followed by another natural 20, killing the arch-villain that had been taunting and tormenting our group for a couple years of gaming. Ok, that’s two die rolls, so I’m stretching a little bit. And for anyone who knows D&D, I probably need to explain why this was so horrible — and then I’ll share the revelation it gave me.